Less than two weeks old, Burma Bear is the latest takeout lunch spot to open in Uptown Oakland. Across the street from my work, my arms are wide open to welcome Burma Bear to the neighborhood. 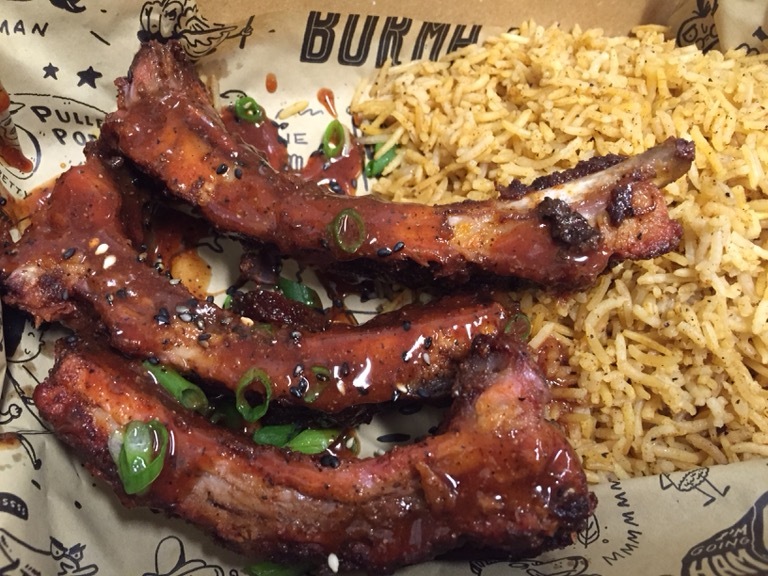 The Chef and Grillmaster is Hubert Lim, aka Burma Bear, who brings a mix of Burmese food and BBQ to our palettes. It’s a pretty simple menu. You choose a meat (protein) and a side. I chose baby back ribs and biryani rice. The saucy ribs had been rubbed with loads of aromatic spices and had a spicy kick to it. They were tender and delicious. The rice complemented the ribs very well. 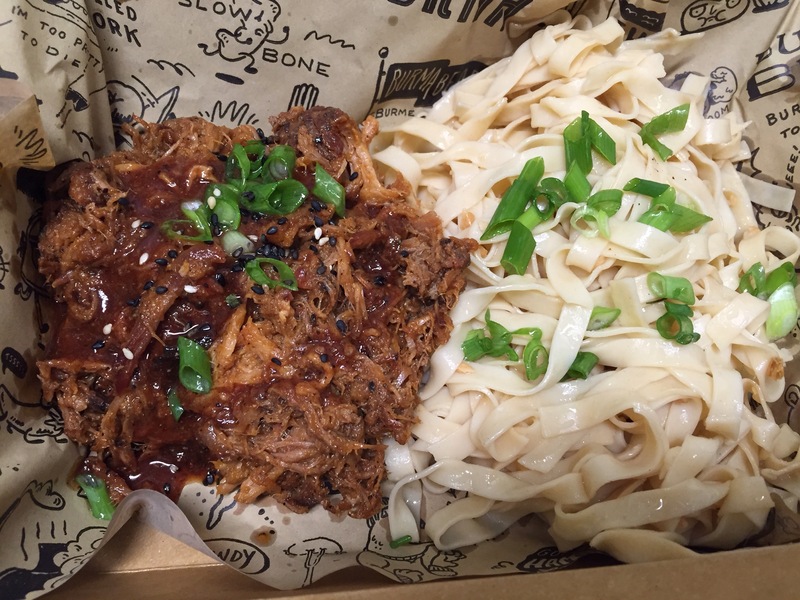 My colleague chose the kalua pulled pork and the garlic noodles. The shredded pork was moist, but cooked with BBQ sauce it leaves some crispy bits which is nice. I really enjoyed the garlic noodles as well. 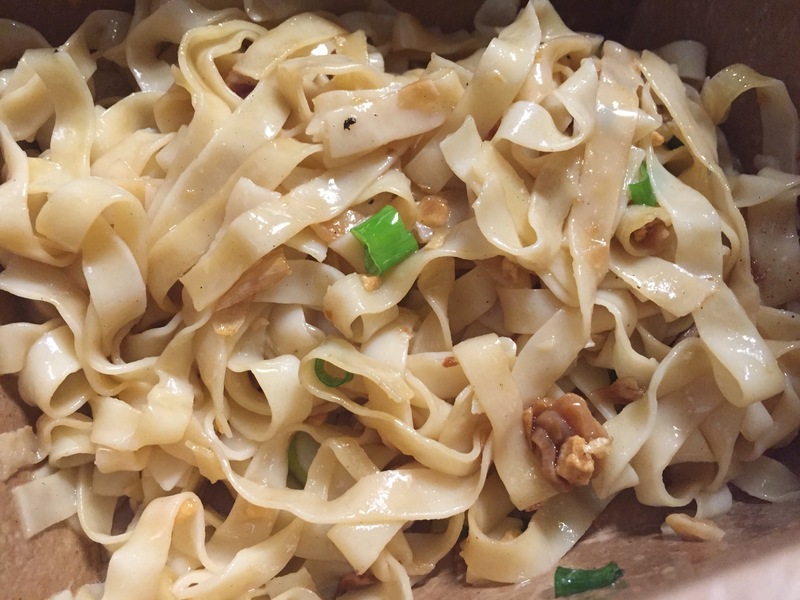 The taste of garlic and butter in the thin noodles are well balanced and light. 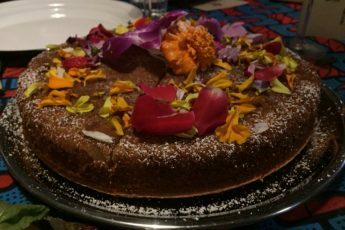 Tea leaf salad is a very popular Burmese dish. The one from Burma Bear doesn’t have the same effect I get when I eat it at other Burmese restaurants. All the ingredients are already mixed together and this version comes with iceberg lettuce, rather than cabbage. You can choose a tea leaf salad made with kale if that is your thing. 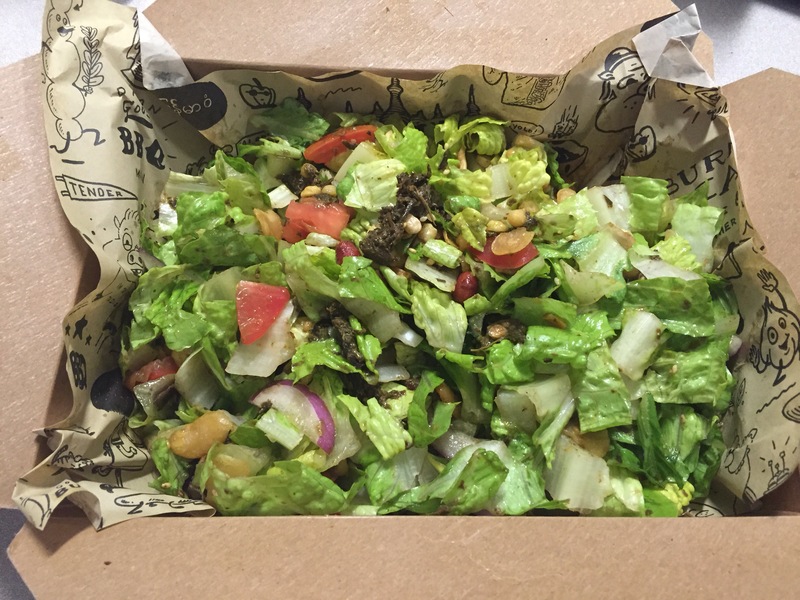 Overall, the tea leaf salad was disappointing compared to others I have eaten. 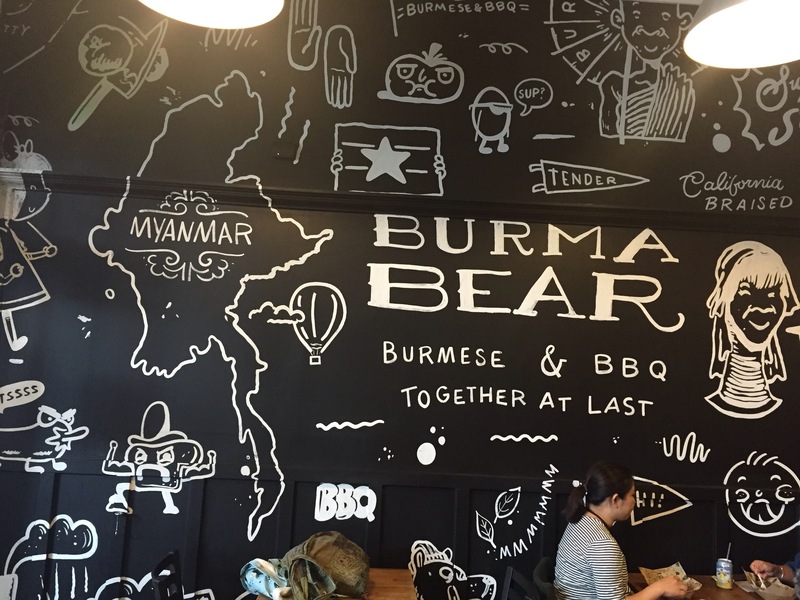 I am ecstatic to have Burma Bear around to bring diversity to the Uptown area and a fun mashup of Burmese and BBQ. The small storefront offers a few spots to eat, but I prefer takeout anyways. 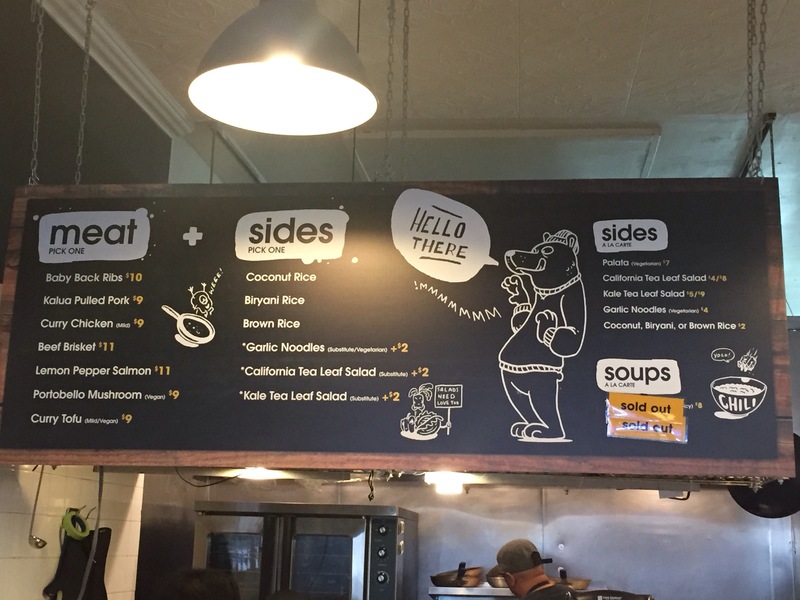 On a nice day, you can order Burma Bear and eat at Snow Park. Another shop is located in the Haight Ashbury district of San Francisco.